Barry Lamar Bonds is a former American baseball player who has estimated net worth of $80 million. He played several seasons with The Pittsburgh Pirates and later played for the San Francisco giants. 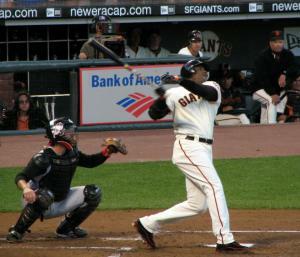 During his professional career and before retirement in 2007, Barry Bonds was able to set some world records. He was a 14-time-All-Star and 8-time Gold Glove Award winner – of course, this success was the main reason for increasing Barry Bonds net worth. However, Bonds career is usually considered as scandalous and controversial because of problems with illegal steroids he used before competitions. Barry Bonds was born on July 24, 1964, in Riverside, California. He is the son of the famous Bobby Bonds – All-Star outfielder in the major league – maybe this was one of the reasons why the son decided to begin a baseball career too. Barry attended Junipero Serra High School and showed himself proficient in various sports, especially basketball, football and baseball. However, he decided to devote his future to baseball. He played on the junior varsity team in school, and later continued his career at Arizona State University. Bonds started to play professionally and raise his net worth in 1986, and was one of the best baseball players until his retirement in 2007. Barry L. Bonds net worth increased almost proportionally with his experience. In total he earned almost $190 million. In 1986-1987 Barry’s salary was only $60,000, but just 5 years later he was earning about $8,500,000. But the biggest earnings and the biggest investments in Barry Bonds net worth were in the end of his career. In years 2005-2006 he earned $22,000,000, and for the last year of playing Barry earned $19,331,470. In his personal life, Barry Bonds met his wife Susann “Sun ” Margreth Branco in August 1987. They had two childrens, Nikolai and Shikari, but the couple separated after seven years, after which Barry provided $20,000 from his own net worth in child support each month. although this amount of money doesn’t look extremely huge if we know how rich Barry Bonds is. In 1994 Barry started an intimate relationship with Kimberly Bell and even purchased her a villa in Scottsdale, Arizona. However, they weren’t married and this relationship continued until May 2003. It didn’t stop Barry from a second marriage on January 10, 1998 with Liz Watson. With their daughter Aisha Bonds they lived in Los Altos Hills, California, and although this marriage lasted a little longer than the previous one, the couple broke up in 2009. During his baseball career Barry Bonds net worth rose even more as he held many records, such as home runs in a single season in 2001, home runs against the different pitchers, slugging percentage in a single season, consecutive seasons with 30 or more home runs or walks in a single season. Until today Barry is known as one of the best players of all time despite his scandalous career and controversial opinions about his fair or unfair game during his career.